Among Angelina’s generation, each of the female family members had a special dish that she was known for. My great-aunt, Angelina’s sister, who we called zi’-zi’ (loosely translated, ‘auntie’), was the ravioli specialist. Another great-aunt, zi’ Annin’, was known as “the little pie-maker” and yet another specialized in calzone pugliese, which we used to call ‘onion pie’. Angelina, on the other hand, was known for her lasagna, which was almost always a part of our epic Sunday dinners at her place. It was only later in life that I realized that the lasagna that Angelina made had a name, and was not really her lasagna, but a traditional dish from Campania, the region where she was born. There the dish is called lasagna di carnevale (also called lasagne di carnevale in the plural) since this meaty lasagna is traditionally eaten around Carnevale aka Mardi Gras time, as a last meat ‘splurge’ before the privations of Lent—a vestige of the days when Catholics were expected to give up meat for the entire 40 days. As I have mentioned before, this lasagna is one of the two ‘mother’ lasagna dishes in Italian cuisine, the rustic southern cousin to the North’s elegant lasagne alla bolognese. Since most Italian immigrants to the US came from the South, it is this lasagna that will be most familiar to Italian-Americans. And even if for most of us it has lost its original association with Carnival celebrations and Lent, there is still something special about enjoying this classic comfort food at this time of year. Step 1: Make the ragù: This step should be done the day before, both because the ragù itself takes several hours to cook and because it tastes much better the next day. Angelina always used her signature ragù della domenica or Sunday sauce. Make sure that the ragù is not too thick—it should be quite loose—loose enough to pour easily—to account for evaporation as the dish bakes. Dilute with water if need be. Step 3: Make the polpettine: The lasagna is stuffed with, among other things, polpettine, or little tiny meatballs. You should use the same mixture of beef, pork, cheese, bread and seasonings as you would for polpettone, or Italian meatloaf (see this post for the recipe) but make the meatballs just as small as you possibly can, no more than 2-3cm/1 inch round, at most, smaller if you can manage it, remembering that they will be placed between the lasagna layers. Then shallow fry them in light olive oil until just golden brown. The recipe for zitoni al forno con le polpettine, or baked ziti, gives details on how to make these little meatballs. Step 5: Make the ricotta cream and cut up the mozzarella. Mix all the ricotta cream ingredients well in a mixing bowl with a spatula. Step 6: Cook the pasta sheets: Cook the lasagna sheets al dente, remembering that they will cook again in the oven. 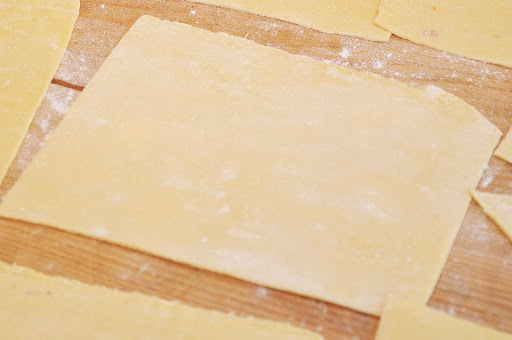 Since these sheets are thicker than the usual pasta and contain a bit of semolina, however, you will need to cook them for longer than other types of fresh pasta, say around 3-5 minutes, depending on how long they have been left to dry. If using factory-made pasta, follow the directions on the box. Do not crowd the lasagna or they may stick together; you may have to cook them in batches. When done, scoop them out with a slotted spoon and pat dry with a towel, taking care not to burn yourself with the hot water that will cling to the pasta sheets. Step 7: Assemble the dish: In a large baking or ‘lasagna’ dish, which you will have greased with lard or olive oil, spread a bit of the ragù over the bottom. Then cover the bottom with a layer of pasta. Since these pasta sheets are rather thick, avoid overlapping them. (You may have to trim the pasta with a knife or a pair of scissors, but that’s fine.) Then cover the pasta with a generous layer of ragù. Top the ragù with the polpettine and, if using, the sausage pieces, and then with dabs of the ricotta cream here and there. (You can add more grated cheese if you like, but in Angelina’s version, there is ample grated cheese in the ricotta cream.) Then place another layer of pasta and repeat, until you’ve used up your ingredients. Top with a generous dusting of grated parmesan cheese and a nice layer of ragù. Drizzle with olive oil. Step 9: Serving the lasagna: When done, remove the lasagna from the oven and allow to settle and cool for at least 30 minutes. In fact, Angelina almost always made her lasagna ahead and reheated it gently, which gave it a rather firm texture and allowed the flavors to meld beautifully. I still like it better that way. As mentioned, Angelina’s version varies in a few details from the classic recipe. First, she always used fresh pasta made from soft flour, while it more usual to use hard-wheat pasta. In fact, according to J.C. Francesconi, author of the much respected La cucina napoletana, hard wheat pasta is actually preferable. Second, she used her ragù della domenica, made from pork ribs and sausages, while the traditional lasagna di carnevale, according to Francesconi, has a somewhat different ragù, made from a single piece of pork roast and some pancetta. And some folks prefer a lighter ragù, cooked only for a few hours, rather than the dark ragù, cooked for six hours or more. Third, Angelina used the ricotta cream described above, mixed with parmesan and egg, while the usual traditional recipes call for ricotta only, or sometimes loosened with some water. milk or ragù. There are subtle variations also in the way that the lasagna can be assembled. Some recipes (including Francesconi’s) call for covering the pasta first with the ricotta, then adding the other cheeses and the meats, and lastly napping the whole with ragù. Other recipes call for mixing equal parts of ricotta and ragù together and layering this mixture on the pasta. Francesconi also cites an interesting variation from Pozzuoli, a coastal town near Naples. There they add cut up bits of the local salami rather than the traditional cervatelline sausages and include hard-boiled eggs sliced into wedges. This is the version that is set out in another favorite cookbook of mine, Napoli in bocca by Antonella Santolini. And in another delightful Neapolitan cookbook, Cucina napoletana: ricette raccontate, Martinella Penta de Peppo suggests using beef, rather than the more traditional pork, as a ‘lighter’ alternative for making the ragù. Rather than little meatballs and sausage, she suggests stuffing the lasagna with slices of the meat from the ragù rather than the usual meatballs and sausage, together with ricotta (loosened with a bit of water), ragù, mozzarella and grated parmesan cheese. Make the ragù: This step should be done the day before, both because the ragù itself takes several hours to cook and because it tastes much better the next day. Angelina always used her signature ragù della domenica or Sunday sauce. Make sure that the ragù is not too thick—it should be quite loose—loose enough to pour easily—to account for evaporation as the dish bakes. Dilute with water if need be. Make the polpettine: The lasagna is stuffed with, among other things, polpettine, or little tiny meatballs. You should use the same mixture of beef, pork, cheese, bread and seasonings as you would for polpettone, or Italian meatloaf (see this post for the recipe) but make the meatballs just as small as you possibly can, no more than 2-3cm/1 inch round, at most, smaller if you can manage it, remembering that they will be placed between the lasagna layers. Then shallow fry them in light olive oil until just golden brown. The recipe for zitoni al forno con le polpettine, or baked ziti, gives details on how to make these little meatballs. Make the ricotta cream and cut up the mozzarella. Mix all the ricotta cream ingredients well in a mixing bowl with a spatula. Take a large ball of fiordilatte (mozzarella made from cow's milk) and cut it into cubes. Cook the pasta sheets: Cook the lasagna sheets al dente, remembering that they will cook again in the oven. Since these sheets are thicker than the usual pasta and contain a bit of semolina, however, you will need to cook them for longer than other types of fresh pasta, say around 3-5 minutes, depending on how long they have been left to dry. If using factory-made pasta, follow the directions on the box. Do not crowd the lasagna or they may stick together; you may have to cook them in batches. When done, scoop them out with a slotted spoon and pat dry with a towel, taking care not to burn yourself with the hot water that will cling to the pasta sheets. 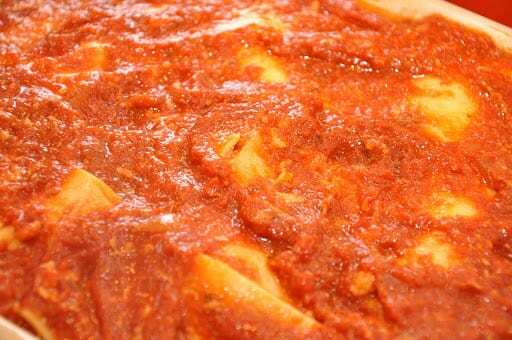 Assemble the dish: In a large baking or 'lasagna' dish, which you will have greased with lard or olive oil, spread a bit of the ragù over the bottom. Then cover the bottom with a layer of pasta. Since these pasta sheets are rather thick, avoid overlapping them. (You may have to trim the pasta with a knife or a pair of scissors, but that's fine.) Then cover the pasta with a generous layer of ragù. Top the ragù with the polpettine and, if using, the sausage pieces, and then with dabs of the ricotta cream here and there. (You can add more grated cheese if you like, but in Angelina's version, there is ample grated cheese in the ricotta cream.) Then place another layer of pasta and repeat, until you've used up your ingredients. Top with a generous dusting of grated parmesan cheese and a nice layer of ragù. Drizzle with olive oil. Bake the lasagna: Bake your lasagna in a moderately hot oven (180C, 350F) for about 45 minutes, until the top is just beginning to brown. Step 9: Serving the lasagna: When done, remove the lasagna from the oven and allow to settle and cool for at least 30 minutes. In fact, Angelina almost always made her lasagna ahead and reheated it gently, which gave it a rather firm texture and allowed the flavors to meld beautifully. I just said to my husband about an hour ago, “I think I have to make lasagna tomorrow”, because I have lots of fresh mozzarella in the fridge. His sarcastic response: “bummer”. I was then deleting old mail and found this one for your lasagna! I’ve been traveling and then had company for 2 weeks and am so behind on everything. That’s really a tasty lasagna, something to enjoy at Carnival. The ricotta cream sounds very yummy, something to try. Happy Mardi Gras. Frank, how do I begin… this post is a complete and thorough reference for Lasagna di Carnevale dal sud. In her day, my mom always included mini-meatballs, something that my daughter never forgets to mention when reviewing other lasagne dishes. Although we are Calabrese la mia zia did insert hard boiled eggs at times, as children we detested it. Lasagne was a Sunday family tradition bringing the extended family together, it typified the Italian American experience on the east coast. Thank you so much for taking your readers on this family journey. And thank *you* Paula, for your kind comment! Beautiful, Frank! I have never had this version, and I love the use of little meatballs. I have made many lasagne in my life and have one more to add to my list. Also, I just want to say how much I appreciate the work your do with each post. The back story and the family memories are wonderful, and I like how you take the time to talk about the variations and how things work. You’re too kind, David. Thanks for the kind words. Thanks for the lead on that blog, Stefano. Took a quick peek and it looks fascinating. The drawings are a particularly lovely touch—I suppose they’re by the blogger herself? Impressive! And you’re right, her recipe is practically identical to my grandmothers. I especially like the fact she rejects the hard boiled egg, I always thought that sounded awful.. in this recipe, that is—nothing against boiled egg in general, of course. The ricotta cream is really interesting — I don’t think I’ve seen that before. Wonderful idea. And what a lasagna! Rich and luscious — perfect fora once a year blowout event! Yep, it’s a lot of work, but really worth it for a special occasion. Amazing to think now that my grandmother would make it nearly on a weekly basis! che fame! I think your aunt and my mum were relatives as her version was almost the same, indeed a heavenly treat. Thanks, Linda! I do like the northern version, too, but this one is definitely worth including in your lasagne repertoire. What could one say about this recipe…?PURE HEAVEN! Amazing, rich and delicious recipe Frank. One of those old school dishes that took a lot of effort but was always cooked with love at heart for those who would enjoy it on a Sunday meal. We’re also preparing for the 40-day Lent here in Greece (it starts on Clean Monday, the 27th) and this is supposed to be the last weekend when meat, fish, eggs and dairy are allowed. The Orthodox version only allows for seafood (anything that doesn’t bleed red, like octopus, calamari, clams/mussels/oysters and the likes, cuttlefish, lobster and shrimp) as a main protein source on Lent. The other one is pulses/legumes and nuts. Perhaps that’s among the reasons most people only follow Lent for about 15-20 days before Easter, at least nowadays. Best wishes to you, too, guys. And thanks for sharing with us some information on your Lenten traditions! I actually love all those Lenten foods–could eat them happily all year round. Your recipes never fail to make my mouth water. I love your recipe history. I wish my mamma were still alive so we could talk about how she learned to cook and what she knew about the recipe’s history. I know the recipes I grew up with had a lot of German influence since we lived near Trieste. I’m saving this recipe to make at a later date. Buon weekend! It would have been a fascinating discussion, Marisa Franca. If that generation were still alive, I’d have a lot of questions… Too bad as kids we don’t always realize what we have. I had never heard of this type of lasagne and those pictures are mouthwatering. I now understand why these were called lasagne di carnevale… quite a dish! Love how descriptive this post is, very interesting read. Yours is one of the only recipes for lasagna that is even close to my grandmother’s way of making lasagna that I’ve ever come across. My grandmother was from Bagnoli, Provincia Avellino…just east of Naples, up in the hills. When she came to the Chicagoland area in the first decades of the 20th C., she brought with her the “Napolitan'” way of cooking that employed filling her lasagnas with hundreds of tiny little handmade meatballs, just like yours. She also mixed her ricotta with eggs and parsley, but added the parmesan throughout the layers individually. One last thing she did that was different from your version. She would hard boil eggs, slice them, and layer the slices in the lasagna as well. It added a certain richness to the dish. Thank you so much for sharing this. My father learned this method from his mother, taught my mother how to do it, and then she in turn taught me. And now I’ve taught my children. And so it goes, down through the generations. This is part of the great beauty and cultural value of cooking. Abbondanza! Wow, Frank. I’ll come over for Sunday dinner any time. This really looks wonderful – soul satisfying and delicious. I can’t tell you how much I appreciate your sharing these treasure. Grazie! Delicious and am now inspired to make lasagne just like my mama used to make…..which incidentally, is pretty much the same as your Angrlina’s recipe! Thanks, @Fiona! So glad you're enjoying the site. Do come back often! Thank you so much for this fantastic recipe! I love ALL the pasta recipes on this site. Traditional recipes, well explained for a novice, and simpler recipes when I am not looking for anything too elaborate. Love it! that first pic is, well just a slice of heaven… been running a little behind down here but I am glad I got to this one, it will be on my to do list, of course, you know I will cheat some…. Wonderful, tasty, and a time honored family tradition! this is a real work of art Frank! Wow, this looks amazing and exactly what I'd expect if I was having dinner at any Nonna's house. Bravo, a splendid dish, superbly described! Love it! I absolutely adore the fact that it is a family recipe! I think I saw this one on Rachel's 30 minute meals… not! I am humbled by this recipe. I will no longer make my own lasagna recipe. OMG lasagne one of my favourite Italian dishes, but I never really got about making them. Thank you so much for sharing!!!! This looks so good. I'm wondering if you will post Lasange in Brodo sometime. It's always intrigued so will you please do it sometime. This looks so amazing! This is something so delicious and the cheese is so overwhelming! Thanks for sharing. I grew up with my mother and aunts making “Sunday” sauce. I still do that. On Saturday. For Sunday. Exquisite lasagna. This looks tremendous – a delicious way to splurge, as you say, before Lent! As much as I love gooey cheese, your grandmother's emphasis on her ragu is so much more appealing. As I scrolled down to read the post, I was also peeking at the wonderful past recipes listed to the left. I envy your family's dinner table! Your recipes always look so delicious. Lasagna is a favorite in my house. Love it! I just love this! 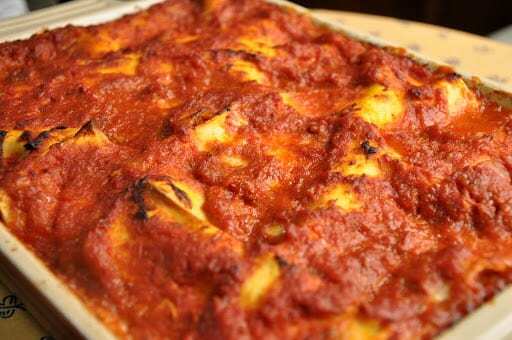 Living in the Emilia Romagna area I am so used to the traditional Lasagne al Ragu but you are so right in naming it Lasagne di Carnivale. Just like with the national festival, so many different and colourful flavours have gone into this! Just looks sublime! Happy Carnevale! That lasagna is perfection. I could go swimming in that ragu. It does look like a regional dish, never heard of this nelle Marche. We mainly prepare the traditional kind, But I can tell from the ingredients that this must be a very tasty dish full of wonderful aromas.